Each November, local chapters of the Association for Fundraising Professionals throughout the world set aside one special day to recognize the significant impact of philanthropy and it's called National Philanthropy Day (NPD). 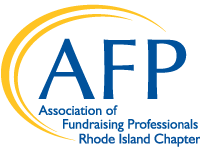 Since 1987, the Association of Fundraising Professionals Rhode Island (AFP-RI) and more than 100 non-profit organizations have come together to honor outstanding philanthropic contributions of corporations, small businesses, individuals and groups. Through philanthropy and volunteering, these individuals and organizations have made a real difference in the lives of men, women and children in Rhode Island and southeastern New England. During the National Philanthropy Day event, recognition is given to more than 50 Partners in Philanthropy by non-profit organizations who want to honor outstanding volunteers and donors. We accept nominations from non-profits and community members, as well as self-nominations. Nomination information will be posted in the summer of 2019. Please check back for more information. To make sure you don’t miss any important information, ask to join our email list by sending an email to info@afpri.org. 2000 Mr. and Mrs. Henry D. Sharpe, Jr.
1998 Mr.* and Mrs.* John Hazen White, Sr.